LG V40 ThinQ Is Official With 5 Cameras, Snapdragon 845 & More - AndroGuider | One Stop For The Techy You! With the exception of Q1 2017, LG's mobile business has turned in losses since Q3 2015. The South Korean tech giant is working on reviving its mobile business back to profit, and the company's latest attempt to achieve that is the V40 ThinQ. The V40 ThinQ shares a lot of features with the LG G7 ThinQ Plus which was launched earlier this year in May. The similarities include Snapdragon 845, 6GB RAM, IP68 dust and water resistance, and a headphone jack with Hi-Fi Quad DAC. The V40 improves over the G7 with a taller 6.4" P-OLED display (versus G7's LCD) and a higher capacity 3300mAh battery (versus G7's 3000mAh). 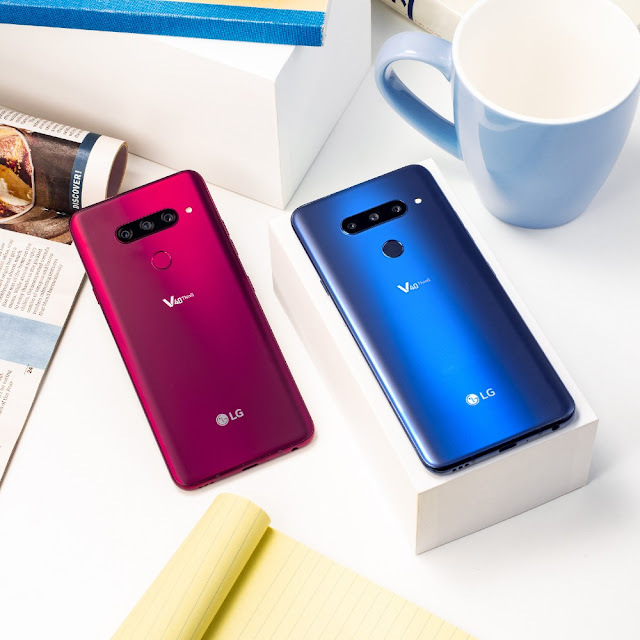 LG's V-series smartphones are known for their emphasis on camera, and the V40 ThinQ's camera setup looks impressive on paper. There are five cameras in all: three on the back and two on the front. The main rear shooter is a f/1.5 shooter with 1.4μm pixel size. The other two sensors include a 107-degree wide-angle 16MP camera with f/1.9 aperture and a f/2.4 12MP telephoto camera. On the front, the standard shooter is an 8MP sensor with f/1.9 aperture and the secondary camera is a 5MP sensor with f/2.2 and a 90-degree field of view for group selfies. The LG V40 ThinQ will go on sale on October 18 in the United States. It starts at $899 and will go on to $980 depending on the carrier choice. There are four colour options: black, pink, silver and blue. The pre-orders can be placed next week onward, that is, October 11. The early birds will be able to take advantage of LG's 'Second Year Promise Program'. There are some free goodies for those who pre-order including a SanDisk Ultra 256GB microSD card and a DJI OSMO Mobile 2 Gimbal. The availability will expand to other markets in the coming weeks.